ARCADIA, California -- Highlights from the Friday night relay carnival at the 59th Arcadia Invitational. The event also held field events and served as Day 1 of the Arcadia Multis heptathlon/decathlon. First Fatima Cortes stalked Ashley Johnson and then Isabella Fauria stalked Cortes. 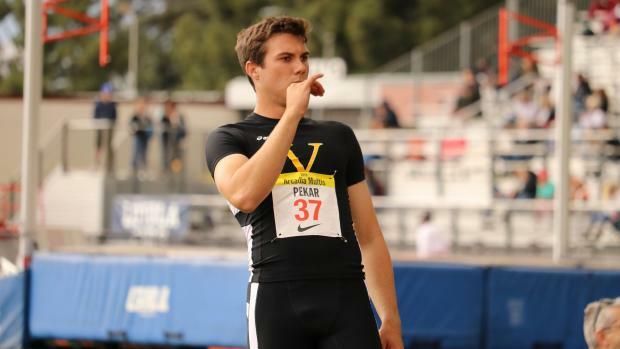 What resulted was two incredible relay races involving the Cal-bound Great Oak senior. 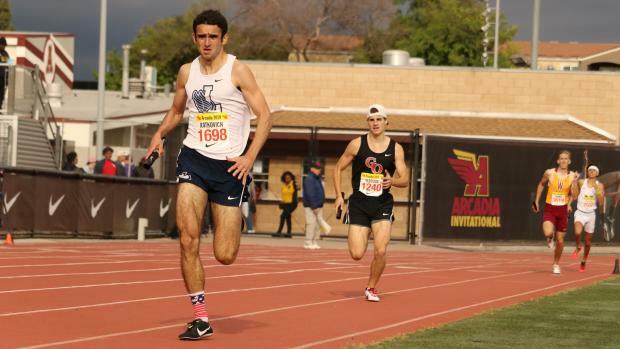 In the 4x800, Cortes took the baton roughly 15 meters behind Johnson, who was anchoring for Mission Viejo (Jeffrey Parenti photo above). Cortes made an initial surge at the outset to narrow the gap and then slowly moved in. 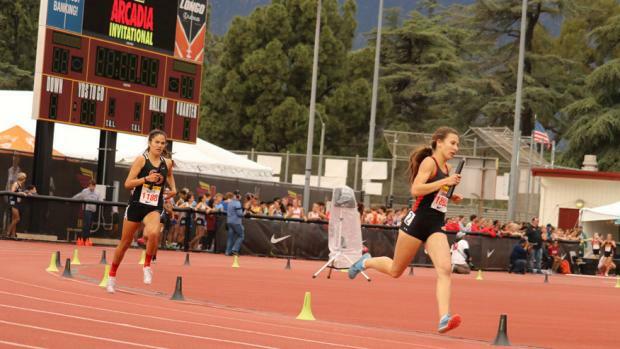 The the second lap with about 100 meters to go, Cortes made her move and brought the Great Oak team of Kendall Harrison, Aubrie Nex and Arianna Griffiths home in 9:10.24, a national-leading time. Johnson's anchor got the Diablos team of Morgan Calcagnie, Kelli Hines and Lauryn Simons across in 9:11.31, a U.S. No. 2 time. A few hours later in the girls 4x1600, it was Cortes' turn to be the prey. Fauria, the St. Francis/Sacramento junior, missed a year and a half of running because of health issues. She's been making up for lost time all spring and displayed her full potential for all to see in running down Cortes on the anchor leg. Fauria brought the team of Tatiana Cornejo, Cate Joaquin and Haley Silva in at 20:20.82, a U.S. leading time. The Great Oak team of Brianna Weidler, Audrey Dang, Griffiths and Cortes crossed in 20:24.83, U.S. No. 2. The Clovis Buchanan team of Meagen Lowe, Amanda Dolberg, Kaylee Elliott and Corie Smith were third in 20:29.63. The top 10 teams in the invitational race slipped under the previous national-leading time of 21:21.48 -- Vista Murrieta, Lees Summit West, Saugus, Walnut, Claremont, Mira Costa and Oakland Tech -- as did the top two teams in the seeded race -- El Toro and Palos Verdes. The top end of a race obliterating the previous national rankings is rather commonplace historically at this meet. 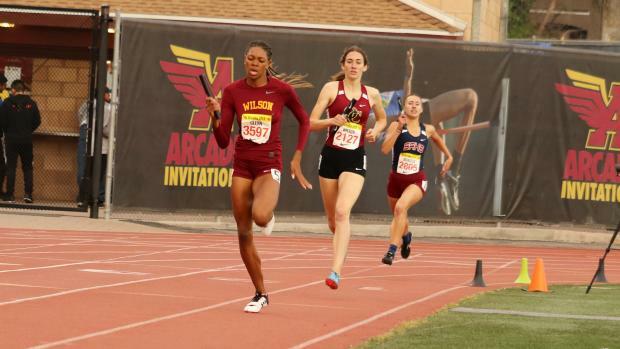 It also happened in the girls 1600 Sprint Medley Invitational were the top four fastest times in the U.S. this spring all came from the same race. Long Beach Wilson, with uber-versatile Rachel Glenn on the 800-meter anchor -- repeat: 800-METER ANCHOR -- held off Julie Morales and San Diego's Scripps Ranch and Hannah Wilson and Oaks Christian in tight race. Glenn crossed in 4:03.06, Morales in 4:03.67 and Wilson in 4:03.72. The previous national leading time was 4:06.85. Chino Hills, with sophomore Jacqueline Duarte on anchor, placed fourth in 4:05.24. The boys got into the rewriting the national rankings act in the 4x1600 relay. Despite two teams being disqualified for passing a lap early, the top 10 teams all went under the previous national leading time of 18:07.91, as did the top four teams in the seeded race. Laguna Beach (Ryan Smithers, Sebastian Fisher, Logan Brooks and Mateo Bianchi) won the invitational race in 17:27.00 to hold off West Ranch (17:32.59), Dana Hills (17:34.86) and Great Oak (17:39.51). Although the elite field events are scheduled to take place beginning late Saturday afternoon, Valor Christian's Cian Quiroga clearly belonged in that flight. As it was, the senior from the Highlands Ranch, Colorado school competed Friday night in the discus throw and won going away with a best of 189-02 that ranks U.S. No. 8. That's a nice improvement from his previous PR of 172-4. Both the rated and seeded divisions of the girls 3200 were held with the invitational eight-lapper coming up Saturday night. Granada Hills Charter freshman Sofia Abrego put up the best time among the two divisions,, winning the rated race in 10:35.79, the No. 2 time in the U.S. in the freshman class and No. 8 time in CA. Davis senior Ellie Lundgreen won the seeded race in 10:36.32. Homewood-Flossmoor (IL) won the girls 800 Sprint Medley Relay in 1:45.57 with Dana Hills second in 1:46.20. Long Beach Poly's 4x200 team of DeAngelo Chester, Kenyon Reed, Kejuan Markham and Anthony Johnson put up a CA-leading time of 1:25.91, bettering their previous state-leading time of 1:28.02. Poly beat Rancho Cucamonga (1:27.75) and Notre Dame Sherman Oaks (1:28.61). It was February 23 when Loyola set the state standard in the 4x800 at 7:52.94. On Friday night, with Great Oak and St. Francis Mountain View among the teams giving chase, the Cubs went even faster. The team of Konnor Paris, Roberto Ruelas, Anthony Stone and Mason Ratkovich needed every bit of that 7:48.13 to hold off the Great Oak quartet of Micah Baird, Cole Sawires Yager, Ryan Shields and Chris Verdugo (7:49.96) and the St. Francis team of Mason Elefant, Euan Cairns, Andrew Shen and Spencer Schwarz (7:53.35). In the boys 800 Sprint Medley Relay, the Harvard Westlake team anchored by Brayden Borquez put up a U.S.-No. 2 time of 1:29.82. Bullis (MD) was second in 1:31.77 and Trabuco Hills was third in 1:32.24. Long Beach Wilson's team of Seaver Cordoza, Collin Elingboe, Andrew Richards and Armando Bryson went 3:28.57 to win the 1600 Sprint Medley Relay, the No. 2 time in the country. Markus Rooth from Norway leads the decathlon with 3,760 points. Derek Pekar of Ventura is second with 3,681.